How does honey help a sore throat? Honey is a powerful antibiotic. Taking honey for a sore throat not only helps soothe the throat, it also inhibits the growth of microorganisms. So, how exactly does honey help in a sore throat? The primary reason is honey’s high sugar content. In this high concentration of sugar, bacteria cannot survive (1). The high sugar content causes water to be removed from bacteria, through a process called osmosis. This dehydration of bacteria leads to microorganism death. Honey’s main role in a sore throat is to create a sticky environment where bacteria die, and the death of bacteria leads to a faster recovery from infection. The amazing thing about honey, though, is that it is not just the high sugar content that prevents microbial growth. There are naturally occurring components of honey that further prevent bacterial growth. This is known because when honey is diluted with water, which decreases the sugar concentration, it still has antimicrobial effects (2). Honey has powerful antioxidant abilities that aid in the healing process. When the throat heals, oxygen radicals are created that damage the surrounding tissue. Honey lessens tissue damage of these oxygen radicals because of the naturally occurring antioxidants in honey. When a spoonful of honey is taken for a sore throat, the honey is diluted by saliva. As the sugar concentration of honey is diluted, naturally occurring enzymes in the honey begin to function. Glucose Oxidase is one of these enzymes. 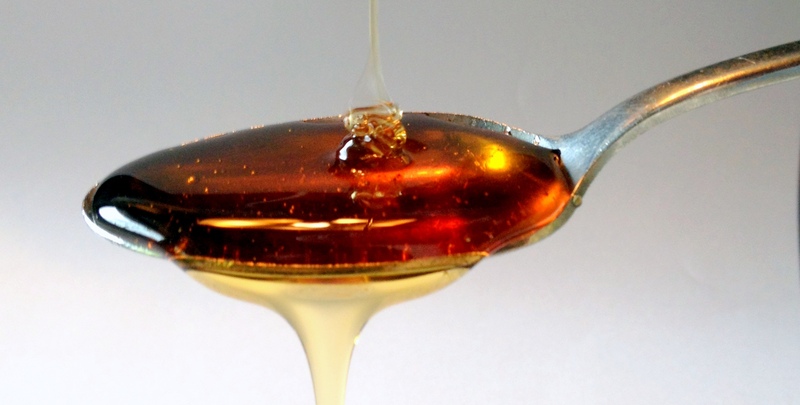 In diluted honey, this enzyme converts sugar to hydrogen peroxide and gluconic acid. Both of these assist in the destruction of bacteria in the throat. Honey creates antimicrobials in the throat that further assist in bacterial infection. The pH of honey is low, typically between 3.7-4.0. This low pH inhibits the growth of microorganisms, especially bacteria. By taking honey for a sore throat when sick, this low pH further destroys bacteria, and inhibits their growth. In addition to the previously described antibacterial properties of honey, honey has a low concentration of phytochemicals. Phytochemicals are naturally occurring compounds in plant-derived foods that provide some benefit other than basic energy needs. These phytochemicals work in a variety of ways to inhibit bacterial growth. The low concentration of these phytochemicals means they play only a small role in honey’s antimicrobial abilities. If you are interested, here are some examples of these phytochemicals: flavanoids, and phenolic acids, including caffeic acid and ferullic acid. Honey helps a sore throat through a variety of different mechanisms. Primarily, honey has a high sugar concentration that leads to microbe death through osmosis. In addition, antioxidants naturally occurring in the honey help to absorb oxygen radicals in the infected area. Honey creates antimicrobials through naturally occurring enzymes. The low pH inhibits the growth of bacteria. Finally, there is a low concentration of phytochemicals that aid in honey’s ability to fight infection. A spoonful of honey is an excellent choice to aid in healing.